While we were expecting him I spent a LONG time researching these bad boys and so I thought I'd take a few minutes to share my findings. I'd vaguely assumed that reusable nappies hadn't changed much and were still awkward folding bits of cloth held together with safety pins. I was wrong! There are some huge bonuses to washable nappies. Firstly, there can be a significant environmental benefit. Disposable nappies biodegrade very slowly and an average infant can easily get through thousands before being potty-trained. These end up in landfill. It's estimated that washable nappies are 40% better for the environment, and if they are also used by younger siblings this can easily be more. Of course, these benefits are shot to pieces if you don't have a very efficient washing machine (or tumble dry your nappies). However, most modern washing machines are incredibly efficient and you can usually wash at 40 degrees these days. There's also a significant financial benefits. For a few hundred pounds you can get a set of good washable nappies (I recommend The Nappy Lady) which will last from birth to potty (and will be fine to use for further children too, you can even sell them used on eBay). The only ongoing costs are associated with extra runs of the washing machine, and you might need to buy extra liners from time to time. You can have a read of a cost comparison on Fill Your Pants. 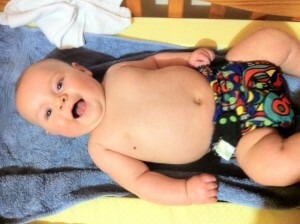 In addition, washable nappies come in a range of cute designs. We like the Bumgenius Freetime as an example of a well-fitting, quick drying, stylish nappy. But there are loads of options available! The Nappy Lady offers an advice service and will suggest some options based on your own priorities. Finally, washable nappies tend to be nice to a baby's skin. Soft fleece liners sit next to baby's bottom and take liquid away from the skin very efficiently. Anecdotal evidence suggests that well-fitting washables can be better at containing wee and poo than disposable equivalents, particularly the more violent poo-explosions. Of course there are some practicalities when it comes to washable nappies. They aren't for everyone. We end up doing a nappy wash around twice every three days, but all of his clothes, wipes and muslins and things get chucked in with the nappies. As a result there's a bit of extra effort here but it's no more bother than any normal load of washing. We dry the nappies on an airer (or outside on the line on sunny days); if you don't have outside space or have a house that makes drying on an airer difficult this may be a snag for you. But isn't it all a bit unsanitary? This can (and should) be a concern to any new parent. We've found little problem in this regard. We wash nappies at 40 degrees (occasionally 60) with some Mio Fresh nappy sanitiser to sort out any bacteria. I also bought a bidet attachment like this for the toilet, which we use to rinse off any poo before the dirty nappy goes in the wash bucket. What about being out-and-about? Like anyone else we have a change bag and this includes a waterproof wet-nappy-bag (with dinosaurs on it). This just gets emptied into the bucket when we get home. No problem! If you have any questions about the practicalities please leave a comment and I'll try to respond. We've invested in a range of different nappies. Our favourite is the Bumgenius Freetime. It comes with poppers or Velcro and is adjustable to fit from birth (about 8lb) to potty training. The absorbent flaps fold out which means it dries on an airer pretty quickly and it comes in a nice range of colours and designs. It's been really good in terms of containment and absorbs a lot of pee. For "day" nappies we also use the Charlie Banana one-size. This is another birth-to-potty adjustable nappy but uses a pocket system into which you insert an absorbent pad. These are slimmer fitting than the Bumgenius but, as a result, need changing more frequently as there is less absorbancy. The main nappy dries very quickly and the pads dry quickly too. At nights we often use Big Softies with an extra pad for maximum pee absorption to minimise night changes. These use a separate waterproof wrap (we use the Motherease Rikki) and can last for hours and hours without needing a change (assuming they remain poo-free). To help preserve the nappy we use fleece liners. These enable any liquid to wick away from the skin but also catch poo to avoid staining. They get rinsed in the loo if needed before being put in the bucket ready to wash. Finally, we have some washable wipes to wipe and clean between nappies. One side is cotton, the other is fleece. This means that they are nice and soft just to wipe around the area (fleece) but the cotton side is great for dealing with the nastier products of a baby's bottom. They hold together much better than disposable wipes and simply go in the wash with the rest of the nappies after use! Before I started looking into them I'd assumed that washable nappies weren't really a viable option any more. However, with a little bit of effort I've found that there are loads of benefits. For any new(ish) parents or parents-to-be I'd encourage you to investigate; disposable nappies are not the only option! I accept that there are lots of possible reasons why washables aren't suitable for everyone. Fair enough. However, the disposable nappy manufacturers can make it seem like there's no real choice; please be encouraged to look at what's available.